There has been some more interest in the ruined church at Stanton Low. I suppose that in the over-developed area of Milton Keynes this may be the only authentic ruin. Little bits of Bradwell Abbey remain, but apart from churches, medieval buildings are few indeed. 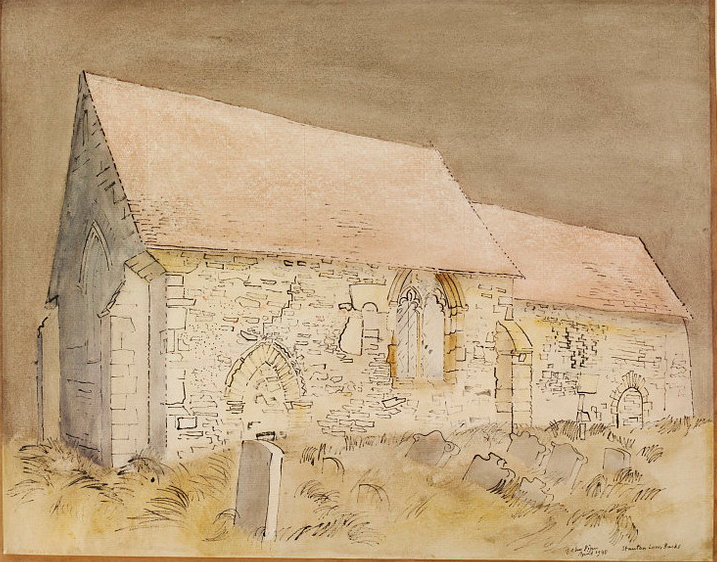 Here is a watercolour by the artist John Piper (1903-1992). Piper was well known in his lifetime and had a special interest in churches. He designed the great stained glass window in the new Coventry Cathedral. It is somewhat surprising that this rather humble out-of-the-way church captured his attention. It is the property of the V&A Museum. Both these views are from the south side. 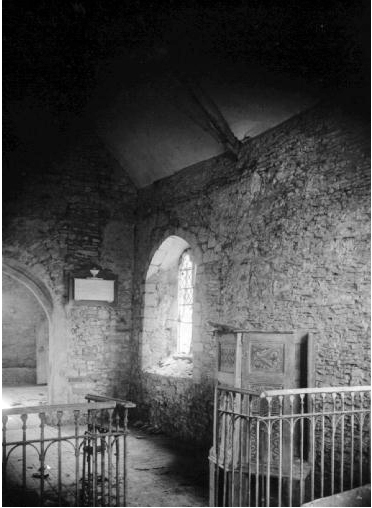 The chancel on the east side, measuring internally 29′ 4″ by 13′ 3″, was probably the original church. The nave, measuring 25′ 6″ by 18′, was an early 12th century addition, although it was apparently 10 feet longer at one time. There is also evidence of another chapel on the south side. The modifications may date from the 15th century. The east window is 14th century but the arch joining the two parts of the church, decorated with chevrons dates from 1150. 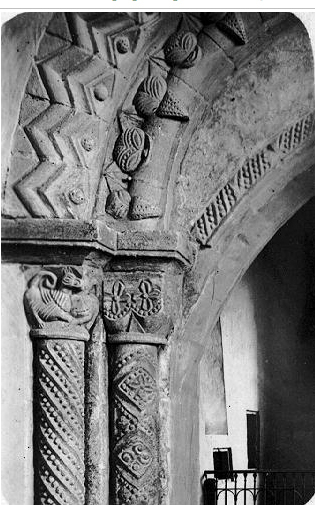 This was removed to St James, New Bradwell after the roof of St Peters fell in in 1956. The gothic arch you can see in the picture was probably added in the 14th century to strengthen the arch. 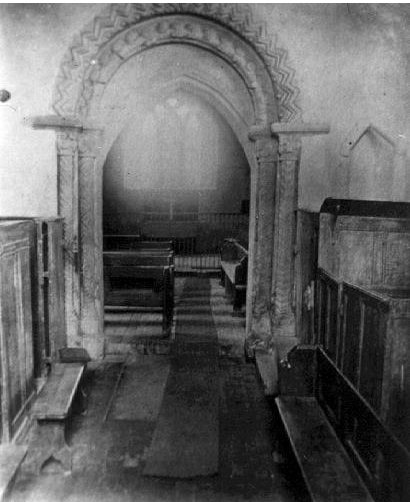 This last photograph, taken from the chancel circa 1950, shows the church stripped of pews and furniture. 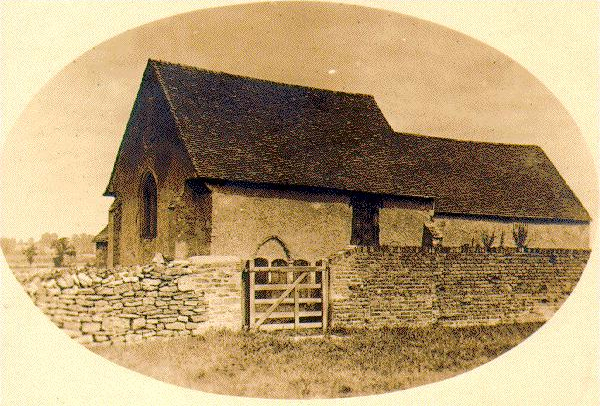 By this time the church was no longer in use.